listen); officially Miasto Katowice; Template:Lang-szl; German: Kattowitz) is a city in southern Poland, with a city-proper population of 297,197 making it the eleventh-largest city in Poland as of 2017 and is the center of the Katowice metropolitan area, which has approximately 2 million people. Throughout the mid-18th century, Katowice had developed into a village upon the discovery of rich coal reserves in the area. In 1742 the First Silesian War transferred Upper Silesia, including Katowice, to Prussia. Subsequently, from the second half of the 18th century, many German or Prussian craftsmen, merchants and artists began to settle in the region, which had been inhabited mostly by Poles over the past hundreds of years. Simultaneously Silesia experienced the influx of the first Jewish settlers. In the first half of the 19th century, intensive industrialization transformed local mills and farms into industrial steelworks, mines, foundries and artisan workshops. This also contributed to the establishment of companies and eventual rapid growth of the city. At the same time, Katowice became linked to the railway system with the first train arriving at the main station in 1847. The outbreak of World War I was favourable for Katowice due to the prospering steel industry. Following Germany's defeat and the Silesian Uprisings, Katowice and parts of Upper Silesia were annexed by the Second Polish Republic. Poland was then backed by the Geneva Convention and the ethnic Silesian minority. On 3 May 1921, the Polish army entered Katowice and the Polish administration took control. The city became the capital of the autonomous Silesian Voivodeship as well as the seat of the Silesian Parliament and Committee of Upper Silesia. After the plebiscite, many former German citizens emigrated, however a vibrant German community remained until the end of World War II. In 1939, after the Wehrmacht seized the town, Katowice and the provinces were incorporated into the Third Reich. The town was eventually liberated by the Soviet army on 27 January 1945. Today, the city is considered as an emerging metropolis. The whole metropolitan area is the 16th most economically powerful city by GDP in the European Union with an output amounting to $114.5 billion. Katowice is the seat of the Polish National Radio Symphony and Orchestra. It also hosts the finals of Intel Extreme Masters, an Esports video game tournament. In 2015, Katowice joined the UNESCO Creative Cities Network and was named a UNESCO City of Music. For more details on this topic, see History of Katowice. The area around Katowice, in Upper Silesia, has been inhabited by ethnic Polish Silesians from its earliest documented history. Initially it was ruled by the Polish Silesian Piast dynasty until its extinction. The settlement of the area surrounding Katowice dates back to the end of the 12th century. From 1138, the Bytom castellany encompassed territories where Katowice is located nowadays. In 1177 the lands were legally handed over by Duke Casimir II the Just to his nephew Mieszko I Tanglefoot; this justified their incorporation into the medieval Silesian provinces. At the turn of the 14th century, new villages called Bogucice, Ligota, Szopenice and Podlesie were established, as well as the village of Dąb, mentioned in 1299 in a document issued by Duke Casimir of Bytom. From 1327, the region was under Czech administration as part of the Kingdom of Bohemia. In historical documents dating from 1468 there was a reference to the settlement of Podlesie, which, at present, is one of the city districts, whereas the village of Katowice (or "Katowicze" in older records) was first mentioned in the year 1598. Historians assume that Katowice was founded on the right bank of the Rawa river by Andrzej Bogucki in around 1580. In 1598 a village called Villa Nova was also documented to stand in the area now occupied by the city of Katowice. By this time the territory had changed from the Bohemian Crown to the domain of the Austrian Habsburg dynasty. Kattowitz gained city status in 1865 in the Prussian Province of Silesia. The city flourished due to large mineral (especially coal) deposits in the nearby mountains. Extensive city growth and prosperity depended on the coal mining and steel industries, which took off during the Industrial Revolution. The city was inhabited mainly by Germans, Silesians, Jews and Poles. In 1884, 36 Jewish Zionist delegates met here, forming the Hovevei Zion movement. Previously part of the Beuthen district, in 1873 it became the capital of the new Kattowitz district. On 1 April 1899, the city was separated from the district, becoming an independent city. Under the Treaty of Versailles after World War I, the Upper Silesia plebiscite was organised by the League of Nations. Though Kattowitz proper voted 22,774 to remain in Germany and 3,900 for Poland, it was attached to Poland as the larger district voted 66,119 for Poland and 52,992 for Germany. 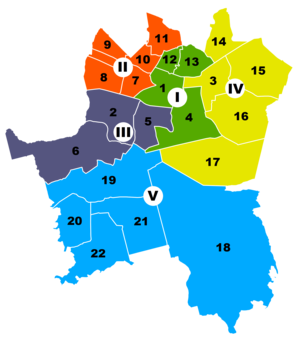 Following the Silesian Uprisings of 1918–21 Katowice became part of the Second Polish Republic with some autonomy for the Silesian Parliament as a constituency and the Silesian Voivodeship Council as the executive body). During the early stages of World War II and the Poland Campaign, Katowice was essentially abandoned, as the Polish Army had to position itself around Kraków. While the shelling of Westerplatte on 1 September 1939 is recognised as the first involvement in the Second World War, Hitler actually ordered a silent sabotage mission a day earlier by dressing his SS officers as Polish soldiers. Hitler staged a mock attack on the Gliwice radio mast, one of the tallest wooden structures in the world, which was just on the eastern border of Germany at the time. The international press and reporters were rushed to the scene and instructed to view corpses dressed in Nazi uniforms, supposedly murdered by Poles, at Dachau concentration camp. It was Hitler's justification for his invasion of Poland, which occurred the next morning. As the infamous SMS Schleswig-Holstein battleship fired on the Polish defensive fortifications outside Danzig, Nazi troops were already advancing deep into Silesia. Katowice at the time was fiercely defended by an insignificant army mostly compiled of Polish scouts and volunteers. Under the Nazi occupation many of the city's historical and iconic monuments were destroyed, most notably the Great Katowice Synagogue, which was burned to the ground on 4 September 1939. This was followed by the alteration of street names and the introduction of strict rules. Additionally, the use of Polish in public conversations was banned. The German administration was also infamous for organising public executions of civilians and by the middle of 1941, most of the Polish and Jewish population was expelled. Eventually Katowice was occupied by the Red Army in January 1945. Significant parts of the downtown and inner suburbs were demolished during the occupation. This, however, was cannot be compared with Warsaw, where the level of destruction reached 85%. As a result, the authorities were able to preserve the central district in its former pre-war character. The post-war period of Katowice was characterised by the time of heavy industry development in the Upper Silesian region, which helped the city in regaining its status as the most industrialised Polish city and a major administrative centre. As the city developed so briskly, the 1950s marked a significant increase in its population and an influx of migrants from the Eastern Borderlands, the so-called Kresy. The city area began to quickly expand by incorporating the neighbouring communes and counties. However, the thriving industrial city also had a dark period in its short but meaningful history. Most notably, between 7 March 1953 and 10 December 1956 Katowice was called Stalinogród in honour of Joseph Stalin, leader of the Soviet Union. The change was brought upon by an issued decree of the State Council. The date of the alteration of the city name was neither a coincidence or accidental as it happened on the day of Stalin's death. In this way the Polish Communist Party and the socialist authority wanted to pay tribute to the dictator. The new name never got accepted by the citizens and in 1956 the former Polish name was restored. The following decades were more memorable in the history of Katowice. Regardless of its industrial significance, it started to become an important cultural and educational centre in Central and Eastern Europe. In 1968 the University of Silesia, the largest and most valued college in the area, was founded. Simultaneously the construction of large housing estates began to evolve. Furthermore, a lot of representative structures were erected at that time, including the Silesian Insurgents' Monument (1967) and Spodek (1971), which have become familiar landmarks and tourist sights. The 1960s and 1970s saw the evolution of modernist architecture and functionalism. Katowice eventually developed into one of the most modernist post-war cities of Poland. One of the most dramatic events in the history of the city occurred on 16 December 1981. It was then that 9 protesters died (7 were shot dead; 2 died from injury complications) and another 21 were wounded in the pacification of Wujek Coal Mine. The Special Platoon of the Motorized Reserves of the Citizens' Militia (ZOMO) was responsible for the brutal handling of strikers protesting against Wojciech Jaruzelski's declaration of martial law and the arrest of Solidarity trade union officials. On the 10th anniversary of the event a memorial was unveiled by the President of Poland Lech Wałęsa. In 1990 the first democratic local elections that took place marked a new period in the city's history. The economy of Katowice has been transforming from the heavy industry of steel and coal mines into "one of the most attractive investment areas for modern economy branches in Central Europe". Recently, the city's efficient infrastructure, rapid progress in overall development and an increase in office space has made Katowice a popular venue for conducting business. The Katowice Expo Centre (Katowickie Centrum Wystawiennicze) organises trade fairs or exhibitions and attracts investors from all over the world. Katowice is a city in Upper Silesia in southern Poland, on the Kłodnica and Rawa rivers (tributaries of the Oder and the Vistula respectively). It is in the Silesian Highlands, about 50 km (31 mi) north of the Silesian Beskids (part of the Carpathian Mountains) and about 100 km (62 mi) southeast of the Sudetes Mountains. Katowice is in the Katowice Highlands, part of the Silesian Highlands, in the eastern part of Upper Silesia, in the central portion of the Upper Silesian Coal Basin. Katowice is an urban community in the Silesian Voivodeship in south-west Poland. It is central district of the Silesian Metropolis—a metropolis with a population of two million. It borders the cities of Chorzów, Siemianowice Śląskie, Sosnowiec, Mysłowice, Lędziny, Tychy, Mikołów, Ruda Śląska and Czeladź. It lies between the Vistula and Oder rivers. Several rivers flow through the city, the major two being the Kłodnica and Rawa. Within 600 km (370 mi) of Katowice are the capital cities of six countries: Berlin, Vienna, Prague, Bratislava, Budapest and Warsaw. The climate is temperate of type humid continental (Köppen: Dfb). The average temperature is 8.2 °Celsius (−1.5 °C (29 °F) in January and up to 18 °C (64 °F) in July). Yearly rainfall averages at 608.5 mm (23.96 in). Characteristic weak winds blow at about 2 m/s from the west, the Moravian Gate. 297197 Expression error: Unrecognised punctuation character "". At present, the city of Katowice is inhabited mostly by Poles and ethnic Silesians, but also by several minorities of Germans, Czechs and Moravians. This also makes the region religiously and culturally diverse. Over the years this diversity has strongly reflected on local architecture such as tenement housing and state buildings. The recent Polish census showed that the Silesians are the largest ethnic minority in Poland, with Germans being second on the list. Both of these minorities mostly live in the Silesian region. It is therefore the most multicultural province and voivodeship of Poland. Prior to the Second World War, Katowice was mainly inhabited by Poles and Germans. The 1905 Silesian demographic census has shown that Germans made up nearly 75% of the total population. Following Germany's defeat in 1945, the large German majority was forced to flee. Most pre-war citizens (excluding Poles) were violently expelled by the new authorities. This resulted in a large group of exiled Silesians living in present-day Germany, creating a new association of Landsmannschaft Schlesien. One of its most notable spokesmen and leaders is the Christian Democratic Union politician Herbert Hupka. During the war, the Nazi occupant committed severe crimes against the local Gypsy and Jewish communities. Most of them were eventually killed or transported by cattle wagons to concentration camps such as Auschwitz for complete extermination. This led to a population drop between 1939 and 1945. Katowice lies in the centre of the largest conurbation in Poland, one of the largest in the European Union, numbering about 2.7 million. The Katowice urban area consists of about 40 adjacent cities and towns, the whole Silesian metropolitan area (mostly within the Upper Silesian Coal Basin) over 50 cities or towns. The metropolitan area has a population of 5,294,000. In 2006, Katowice and 14 adjacent cities united as the Upper Silesian Metropolis. Its population is 2 million and its area is 1,104 km². In 2006-2007 the union planned to unite these cities in one city under the name "Silesia", but this proved unsuccessful. The Katowice conurbation comprises settlements which have evolved because of the mining of metal ores, coal and raw rock materials. The establishment of mining and heavy industry which have developed for the past centuries has resulted in the unique character of the cityscape; its typical aspects are the red brick housing estates constructed for the poorer working class, factory chimneys, manufacturing plants, power stations and quarries. The inhabitants of a large mining community like Katowice, and local administrations within the conurbation, which have only evolved due to mining, are a subject to overall decline after the liquidation of coal mines and factories. This is one of the reasons which led to the development of the service sector, including office spaces, shopping centres and tourism. Katowice did not originate as a medieval town. The city centre was beginning to form in the mid-19th century when it was part of the Kingdom of Prussia and had an ethnic German majority. The buildings of the time are decorated in an eclectic style (mostly Renaissance with elements of Baroque) and elements of Art Nouveau style (Polish: secesja). By the end of the nineteenth century the centre was being referred to as a "little Paris" due to the presence of Parisian-styled tenement houses. Examples of Modernism, especially International Style and Bauhaus inspired architecture, still coexist with modern office buildings in central Katowice. Between the 1950s and 1980s many socialist apartment blocks were constructed around the inner suburbs. Notable examples from that period include a multipurpose arena complex called Spodek and parts of Koszutka district. Katowice is one of the few cities in Poland where nearly all architectural styles are present. For instance, the Market square in Katowice (Polish: Rynek Katowicki) is surrounded by a vast majority of buildings and edifices representing styles such as neoclassicism, modernism, socialist realism and contemporary-modern. Some tenements have neogothic elements, which are an outstanding example of this type in Central and Eastern Europe. The street outlines, especially within the older inner districts, closely resemble the ones in Paris. Representational boulevards and promenades were established despite the city's strong industrial character. These, however, mostly adorned the city center and not working-class outer suburbs. Unfortunately many old majestic buildings were demolished in the 1950s to make space for monumental modern blocks. Among other reasons for their destruction was the immense architectural detail which once represented the wealth of local industrialists and property owners. This particularly didn't fit in with the Socialist-Communist authority at the time. Today, the marketplace and several nearby streets with shopping promenades are closed to traffic. Market square and adjacent streets: Warszawska, Teatralna, Dyrekcyjna, Staromiejska, Dworcowa, św. Jana, Pocztowa, Wawelska, 3 Maja, Stawowa, Mielęckiego, Starowiejska and Mickiewicza, the so-called "Great Market Square of Katowice" or "Old town of Katowice"—many historic (monument) buildings. This is a group of functional-architectural. On the market square and most of the above-mentioned streets are prohibitions or restrictions on cars. Streets: Staromiejska, Dyrekcyjna, Wawelska, Stawowa and Warszawska is lined decorative cobblestone creating a pedestrian zone. The authority plans to Katowice—Quarter streets: św. Jana, Dworcowa, Mariacka, Mielęckiego, Stanisława and Starowiejska is to become so "small market square". Silesian Insurgents Monument (Polish: Pomnik Powstańców Śląskich), the largest and heaviest monument in Poland. It is a harmonious combination of architecture and sculpture with appropriate symbolism: the wings symbolize the three Silesian Uprisings 1919 - 1920 - 1921 while the names of places that were battlefields are etched on the vertical slopes. The monument, which was funded by the people of Warsaw for Upper Silesia, is considered Katowice's landmark. Parachute Tower - a 50 m (160 ft) tall lattice tower built in 1937 for training parachutists. It was used in the first days of World War II and is the only parachute tower in Poland. Katowice Rondo, the large square/roundabout, reconstructed recently, with the semi-circular Galeria Rondo Sztuki in the centre. Silesia City Center - Large shopping mall in Katowice. Located over former coal mine "Gottwald"
Katowice is a large coal and steel center. It has several coal mines (Wujek Coal Mine, Mysłowice-Wesoła Coal Mine, Wieczorek Coal Mine, Murcki Coal Mine, Staszic Coal Mine) organized into unions—Katowice Coal Holding company (pl: Katowicki Holding Węglowy), two steelworks (Huta Baildon, Huta Ferrum), and one foundry of non-ferrous metals (Huta Metali Nieżelaznych Szopienice). Katowice is a large business and trade fair center. Every year in Katowice International Fair and Spodek, tens of international trade fairs are organized. Katowice has the second largest business centre in Poland (after Warsaw Business Centre). Skyscrapers stand along Chorzowska, Korfantego and Roździeńskiego street in the centre. The newest office buildings (A-class) are the Chorzowska 50, Altus Skyscraper and Silesia Towers (under construction). Katowice is the seat of Katowice Special Economic Zone (Katowicka Specjalna Strefa Ekonomiczna). The unemployment rate is one of the lowest in Poland, at 2% (2008). The city is still characterized by its working class strength and attracts many people from neighbouring cities (other districts USMU seeking jobs. Katowice is the cultural centre of the entire Silesian agglomeration inhabited by over two million people and one of the leading cultural spots in Poland. Most importantly, it is a host city to some of the biggest theatrical and stage events. This also includes hosting gatherings and exhibitions well as film and musical events. Annual musical festivals such as the Rawa Blues, the Tauron New Music Festival, the Silesian Jazz Festival, the Mayday Festival and other concerts, which attract yearly hundreds of thousands of tourists from the entire country. Katowice also temporarily hosts the OFF Festival, the most important alternative event in Poland. Katowice is the seat of an internationally renowned Karol Szymanowski Academy of Music, as well as the Polish National Radio Symphony Orchestra. The Silesian Philharmonic also has its seat in Katowice. The opening of a new architectural complex of the National Polish Radio Orchestra took place in 2014. A showcase for Katowice is the "Camerata Silesia" - an ensemble aimed at promoting the city in Poland and overseas. Classical music also plays significant role in Katowice and the city annually becomes a venue for numerous classical concerts and festivals. The list includes an International Festival of Young Music Competition Laureates, The Grzegorz Fitelberg International Competition for Conductors, Chamber Music Festival, Ars Cameralis Festival and Katowice's opera, operettas and most of all ballet. In 2010, as part of the Chopin Year Celebrations, Katowice held the International Chopin Knowledge Challenge, which took place at the Spodek hall. The BWA Contemporary Art Gallery in Katowice, established in 1949, is a notable institution concerning the contemporary arts. Every three years, it is responsible for the organisation of the Polish Graphic Art Triennial. Several other galleries feature exhibitions of the works by artists from abroad alongside with film screenings, workshops for children and public fairs. The Silesian Museum in Katowice, opened in 1929, exhibits works by famous and renowned Polish artists like Józef Chełmoński, Artur Grottger, Tadeusz Makowski, Jacek Malczewski, Jan Matejko, Józef Mehoffer and Stanisław Wyspiański. Silesian Theatre, named after the Polish writer and painter Stanisław Wyspiański, is the largest theatre in Silesia. It is located exactly in the central part of the market square facing westward. The complex was originally built as a German theatre between 1905 and 1907 by architect Carl Moritz. Silesian Museum, founded in 1929 by the Silesian Sejm, while the region was recovering from the Silesian Uprisings. In the Polish interbellum (1918-1939), the Silesian Museum was one of the prime institutions within the Second Polish Republic. Silesian Philharmonic, originally established in 1945, its most notable members included Witold Małcużyński, Igor Oistrakh, Sviatoslav Richter and Adam Taubitz. Polish National Radio Symphony Orchestra, created in 1935 and led by Grzegorz Fitelberg until the outbreak of World War II, has recorded nearly 200 compact discs for many domestic and foreign labels. Off Festival, a music festival, which also supports a variety of independent arts and cultural events such as exhibitions, workshops and film screenings. Rawa Blues Festival, the world's largest indoor blues festival named after the Rawa River, which flows through Katowice. International Exhibition of Graphic arts "Intergrafia"
The ESL One Katowice Tournament, for the popular FPS Counter-Strike: Global Offensive, League of Legends, and Starcraft II was held March 12–15, 2015. Katowice is a large scientific centre. It has over 20 schools of higher education, at which over 100,000 people study. The public transportation system of the Katowice and Upper Silesian Metropolis consists of four branches—buses and trams united in the KZK GOP and the regional rail. Additional services are operated by private companies and the state-owned railways. Silesian Interurbans - one of the largest tram systems in the world, in existence since 1894. It spreads for more than 50 kilometres (31 miles) (east-west) and covers 14 districts of the Upper Silesian Metropolis. The city and the area are served by the Katowice International Airport, about 30 km (19 mi) from the city center. With over 20 international and domestic flights daily, it is by far the biggest airport in Silesia (~2,5 million passengers served in 2008; 2 terminals, A and B). Because of the long distance to the airport, there is a proposal to convert the much closer sport aviation Katowice-Muchowiec Airport into a city airport for smaller, business-oriented traffic. Upper Silesian Railway reached the area in 1846. Katowice Central Station is one of the main railway nodes and exchange points in Poland. It has replaced the old Katowice historic train station. The city has direct connections among others with Warsaw, Cracow, Szczecin and Gdynia. Katowice has a long sporting tradition and hosted the final of EuroBasket 2009 and 1975 European Athletics Indoor Championships, 1975 European Amateur Boxing Championships, 1976 World Ice Hockey Championships, 1957, 1985 European Weightlifting Championships, 1974, 1982 World Wrestling Championships, 1991 World Amateur Bodybuilding Championships, 2011 Women's European Union Amateur Boxing Championships, 2014 FIVB Men's World Championship and others. The Silesian Stadium is between Chorzów and Katowice. It was a national stadium of Poland, with more than 50 international matches of the Poland national football team played here and around 30 matches in UEFA competitions. There were also a Speedway World Championship, Speedway Grand Prix of Europe and many concerts featuring international stars. Tourists can relax playing tennis or squash, doing water sports also sailing (for example—in Dolina Trzech Stawów), horse-riding (in Wesoła Fala and Silesian culture and refreshment park), cycling or going to one of numerous excellently equipped fitness clubs. Near the city center are sporting facilities like swimming pools (for example "Bugla", "Rolna") and in neighbourhood—golf courses (in Siemianowice Śląskie). GKS Katowice - men's football, (Polish Cup winner: 1986, 1991, 1993; Polish SuperCup winner: 1991, 1995; 1st league in 2003/2004 and 2004/2005 seasons). ice hockey team Champion: 1958, 1960, 1962 Górnik Katowice / GKS 1965, 1968, 1970. Naprzód Janów Katowice - hockey club playing in Polish Hockey Superleague, vice-champion of Poland (5x): 1971, 1973, 1977, 1989, 1992; bronze medal (7x): 1972, 1974, 1976, 1978, 1982, 1986, 1987; Polish Cup (1x): 1970. ^ a b (2017) "Ludność. Stan i struktura ludności oraz ruch naturalny w przekroju terytorialnym w 2017 r. Stanu w dniu 30 VI 2017 r." (in pl). ^ a b "Katowice, Poland - A City Guide - Cracow Life". Archived from the original on 16 March 2017. http://www.local-life.com/krakow/articles/katowice. Retrieved 15 March 2017. ^ "Local history - Information about the town - Katowice - Virtual Shtetl". Archived from the original on 16 March 2017. https://web.archive.org/web/20170316113346/http://www.sztetl.org.pl/en/article/katowice/3,local-history/?action=view. Retrieved 15 March 2017. ^ o.o., StayPoland Sp. z. "History of Katowice". Archived from the original on 16 March 2017. http://www.staypoland.com/cityHistory.aspx?TownId=14. Retrieved 15 March 2017. ^ "History". Archived from the original on 16 March 2017. https://www.katowice.eu/en/en/katowice-city/history. Retrieved 15 March 2017. ^ "Liberation Memorial Katowice - Katowice - TracesOfWar.com". Archived from the original on 16 March 2017. http://en.tracesofwar.com/article/6708/Liberation-Memorial-Katowice.htm. Retrieved 15 March 2017. ^ "CityProfiles: Katowice". The Urban Audit. Archived from the original on 29 February 2012. https://web.archive.org/web/20120229101123/http://www.urbanaudit.org/DownloadPDF.ashx?CityCode=PL010C. Retrieved 15 August 2012. ^ "Global city GDP 2011". Brookings Institution. Archived from the original on 4 June 2013. https://www.webcitation.org/6H7Jql2A9?url=http://www.brookings.edu/research/interactives/global-metro-monitor-3. Retrieved 26 December 2012. ^ "Katowice - a city of music". https://www.polska.pl/arts/music/katowice-city-music/. ^ a b silnet.pl. "Historia miasta i dzielnic - Katowice". Archived from the original on 2 February 2017. https://mojekatowice.pl/p,s,historia.html. Retrieved 25 January 2017. ^ "History - Katowice". Archived from the original on 16 March 2017. https://www.inyourpocket.com/katowice/history. Retrieved 15 March 2017. ^ (in German) Von Krakau bis Danzig. Thomas Urban. 2004. https://books.google.de/books?id=bM2kvVUpCPYC&printsec=frontcover&dq=urban+danzig&lr=&as_brr=3&as_pt=ALLTYPES#PPA143,M1. Retrieved 2009-03-21. ^ "In Defence of Katowice - Katowice". Archived from the original on 16 March 2017. https://www.inyourpocket.com/katowice/In-Defence-of-Katowice_71265f. Retrieved 15 March 2017. ^ "Katowice, Poland". Archived from the original on 18 March 2017. http://www.jewishgen.org/yizkor/Katowice/Katowice.html. Retrieved 17 March 2017. ^ Centre, UNESCO World Heritage. "Historic Centre of Warsaw". Archived from the original on 15 March 2017. http://whc.unesco.org/en/list/30. Retrieved 17 March 2017. ^ Woźniczka, Zygmunt. "Katowice zniknęły. Powstał Stalinogród. To już 61 lat". Archived from the original on 16 March 2017. http://www.dziennikzachodni.pl/artykul/3355309,katowice-zniknely-powstal-stalinogrod-to-juz-61-lat,id,t.html. Retrieved 15 March 2017. ^ "Jak Katowice Stalinogrodem się stały - HISTORIA.org.pl - historia, kultura, muzea, matura, rekonstrukcje i recenzje historyczne". 10 December 2013. Archived from the original on 2 April 2017. http://historia.org.pl/2013/12/10/jak-katowice-stalinogrodem-sie-staly/. Retrieved 15 March 2017. ^ "Jak Katowice zamieniono na Stalinogród". Archived from the original on 16 March 2017. http://niezalezna.pl/39174-jak-katowice-zamieniono-na-stalinogrod. Retrieved 15 March 2017. ^ www.wirtualnyturysta.com, Wirtualny Turysta,. "Katowice Online - Stalinogrod - Post-War History of Katowice". Archived from the original on 16 March 2017. http://www.silesia-online.com/89,Stalinogrod_-_Post-War_History_.htm. Retrieved 15 March 2017. ^ Witosławska, Agata. "Katowice - the capital city of Upper Silesia". Archived from the original on 28 August 2017. https://www.poland.travel/en-gb/cities/katowice-the-capital-city-of-upper-silesia. Retrieved 15 March 2017. ^ "Katowice - IFMSA SCOPE Wiki". Archived from the original on 16 March 2017. http://wiki.ifmsa.org/scope/index.php?title=Katowice. Retrieved 16 March 2017. ^ "Local weather forecast: Katowice". Archived from the original on 2006-05-14. http://weather.msn.com/local.aspx?wealocations=wc:PLXX0010&q=Katowice%2c+POL. ^ a b "GUS – Baza Demografia: Wyniki badań bieżących: Stan i struktura ludności: Ludność: 2017: Ludność stan w dniu 30 VI: Ludność według płci i miast: Śląskie". Archived from the original on 2014-10-15. http://demografia.stat.gov.pl/bazademografia/Tables.aspx. ^ a b "Silesia". Archived from the original on 1 March 2014. http://www.fact-index.com/s/si/silesia.html. Retrieved 16 March 2017. ^ "Holocaust – oshpitzin.pl". Archived from the original on 16 March 2017. http://oshpitzin.pl/holocaust/. Retrieved 16 March 2017. ^ Lamparska, Marzena (1 June 2013). "Post-industrial Cultural Heritage Sites in the Katowice conurbation, Poland" 1 (2). DOI:10.1515/environ-2015-0011. Retrieved on 16 March 2017. ^ o.o., StayPoland Sp. z. "Katowice - Tourism - Tourist Information - Katowice, Poland -". Archived from the original on 16 March 2017. http://www.staypoland.com/about_katowice.htm. Retrieved 16 March 2017. ^ "Wydawnictwo Muzeum Śląskiego: Lech Szaraniec "Katowice w dawnej i współczesnej fotografii". Archived from the original on 2009-05-22. http://www.sztuka.net/palio/html.run?_Instance=www.sztuka.net.pl&_PageID=445&_RowID=&newsId=516&categoryId=208&callingPageId=491&_CheckSum=-1381753887. ^ "When did a "Flying Saucer" arrive in Katowice? - Katowice". 20 October 2016. Archived from the original on 17 March 2017. http://katowice.pjb.co.uk/flying-saucer-arrive-katowice/. Retrieved 16 March 2017. ^ "Bezrobotni oraz stopa bezrobocia wg województw, podregionów i powiatów (stan w końcu lipca 2008 r.)". Archived from the original on 2008-04-24. https://web.archive.org/web/20080424062901/http://www.stat.gov.pl/gus/45_1487_PLK_HTML.htm. ^ a b c j., Media Partner Sp.. "Culture: People: Invest in Katowice.". Archived from the original on 2017-03-25. http://en.invest.katowice.eu/people/27/culture.html. ^ "Galeria Sztuki Współczesnej BWA w Katowicach - Miejsce - Culture.pl". Archived from the original on 2017-03-25. http://culture.pl/pl/miejsce/galeria-sztuki-wspolczesnej-bwa-w-katowicach. ^ Fortune Magazine (March 3, 2016) Poland Is Home to the Biggest eSports Event in the World "Archived copy". Archived from the original on 2016-07-14. http://fortune.com/2016/03/03/poland-is-home-to-the-biggest-esports-event-in-the-world/. Retrieved 2016-07-25. ^ "COP24". Archived from the original on 28 April 2018. http://cop24.gov.pl/. Retrieved 1 May 2018. ^ "ESL One New York 2018 - Where CS:GO Legends Are Made" (in en-US). https://www.esl-one.com/dota2/katowice-2019/. ^ "KATOWICE TO HOST ‘WORLD SENIORS’". Archived from the original on 5 December 2017. http://bwfbadminton.com/news-single/2017/11/16/katowice-to-host-world-seniors. Retrieved 5 December 2017. ^ "Partnerstädte". Archived from the original on 2014-03-26. http://www.koeln.de/koeln/die_domstadt/partnerstaedte. Retrieved 2009-06-22. ^ "Groningen - Partner Cities". © 2008 Gemeente Groningen, Kreupelstraat 1,9712 HW Groningen. Archived from the original on 2007-09-26. https://web.archive.org/web/20070926211207/http://www.groningen.nl/functies/pagfunctie.cfm?parameter=1285. Retrieved 2008-12-08. ^ "Twin cities of the City of Kosice". Magistrát mesta Košice, Tr.. Archived from the original on 2013-11-05. http://www.kosice.sk/clanok.php?file=gov_s_c-00_uk.html. Retrieved 2013-07-27. ^ "Mobile's Sister Cities". City of Mobile. Archived from the original on 2010-04-24. http://ncsmobile.org/sister_cities.php. Retrieved 2009-11-26. This page uses content from the English language Wikipedia. The original content was at Katowice. The list of authors can be seen in the page history. As with this Familypedia wiki, the content of Wikipedia is available under the Creative Commons License.